I’ve been continuing my efforts to turn my book covers into embroidery patterns and I’ve come to the conclusion that I need to get brighter cover art – I keep running out of black thread. 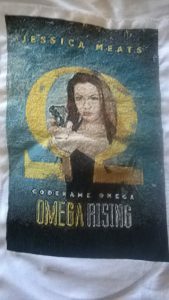 I have now completed my Omega Rising cover and need to get it framed up to match the Between Yesterdays cross stitch I’ve already completed. These take a long while to sew. My sister gave me the pattern for the Omega Rising cover as a Christmas present and I finished sewing it in August. I’ve started the Child of the Hive cover now. At this rate, I might just about finish it by my birthday next year. With the release of the Mischief Corner Books quarterly and the upcoming third book in the Codename Omega series, I’m never going to finish with this project. 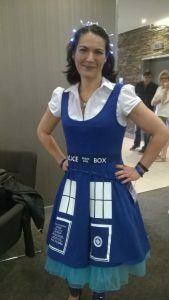 Last weekend was Nineworlds, a science fiction and fantasy convention held in Hammersmith, which had content around books, movies, games, and more. I wanted to share a few highlights from my experience of the convention. Firstly, there was the indie author table. This was in the expo hall and was a place for self-published or small-press-published authors to place their books for sale. I thought this was a fantastic idea, though it could have done with a little more organising. We got an email a couple of days before the event telling us that they needed authors to volunteer to run the table. Five of us did – each taking a four hour stint selling books – but other authors were able to just drop books off to be sold without taking a shift. If this is run in future conventions (which I hope it is) there should be a requirement for all authors to spend at least some time manning the table. After all, it isn’t fair for some people to lose half a day of convention time while others get all the benefits of the table without putting in the same effort. 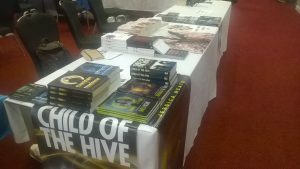 On the plus side though, one of my books was the first to be sold on this table, so I’m pleased about that. 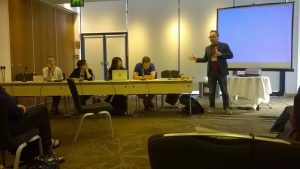 This was the first time Nineworlds has run an expo, so the expo hall wasn’t very large, but there were a couple of tables I wanted to highlight. 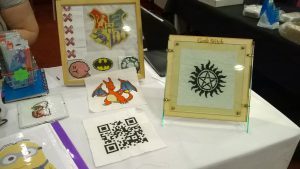 The first was Geek Stitch, who produce a number of cross stitch kits on various geeky themes – from Pokémon to Harry Potter, Steven Universe to Supernatural. Most of these are suitable for beginners. I was particularly impressed by the cross stitched QR code – which actually works! If you’ve been following my blog, you’ll know I’m into my cross stitch, and I liked what these guys had on offer. Another table that interested me was Scorch’s Pyrography. This is the art of using heat to write on wood and other substances. 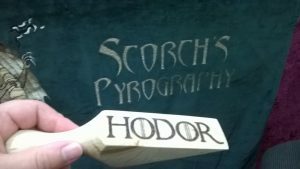 They had a lot of dragons on wooden boxes, some maps from various fantasy worlds (including the map from The Hobbit) but what got people’s interest (and a lot of cries of “too soon” from the Game of Thrones fans) was a doorstop with “Hodor” written on it. There were a lot of sessions people could go to, from silly fun ones to deep philosophical analyses (my friend/editor presented a paper on the philosophy of being recognised – witnessed – in Mad Max Fury Road). There were several of these sessions that I enjoyed in different ways and for different reasons. There was a session on neurodiversity in fiction which got quite intense and one of the audience members got fairly emotional at one point. This was obviously an issue that hit home for a lot of the people in the room. If you’re on Twitter, check out the hashtag #nineworldsnd for discussions and book recommendations. A much more light-hearted session was a Flash Fiction challenge. A group of writers were given prompts and expected to write something based on them in only five minutes. The audience then cheered for the one they liked them most. This was very entertaining and it reminded me of the writing games we used to play with my old writing group – trying to create something very quickly from some strange prompts. While the writers were scribbling away, Lee Harris, editor at Tor.com, entertained us with a quiz on a range of geeky topics – and I was please to be the first to get the Tad Cooper question (I super believe in you, Tad Cooper). 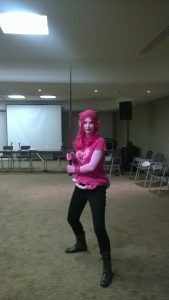 I unexpectedly got a ticket to attend a Swordpunk session. 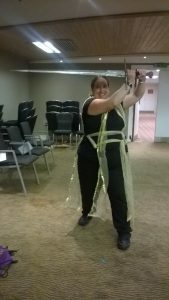 This was a hands on introduction to medieval sword fighting that involved us trying very hard not to stab each other or whack the ceiling while practicing moves with real swords. I say this was unexpected, because this was a session that required tickets and the tickets had sold old almost as soon as they’d been made available. I got in because my former kung fu instructor and his partner were attending and they’d managed to get tickets. Alex decided a few days before the event that he would rather go to another session that was taking place at the same time, so they offered me the spare ticket. In the photos, I’m cosplaying as Abby, one of my own characters from the book Between Yesterdays. Laura is cosplaying as a ghost from a web comic I’d not heard of – complete with hand sewn intestines. 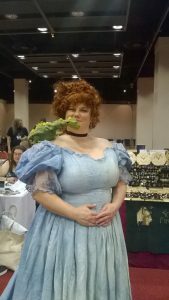 On the subject of cosplay, I got a lot of compliments for my Queen Madalena costume. Wearing an outfit like this makes you appreciate how practical jeans are. I was worried every time I got on an escalator that the dress was going to get caught and either cause a painful accident or just get torn off me, leaving me naked in the hotel. I made it through intact but I was very happy to change into my jeans at the end of the event. 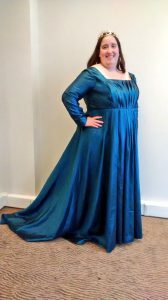 Not a lot of people recognised who I was but I had an amazing moment where I sat next to someone in a panel who turned out to be friends with the costume designer on Galavant. We had an interesting conversation and she was the one who took this photo to send to her friend. On the subject of cosplay, there were some great ones, though I realised I didn’t get many photos of them. I do have a couple I can share but this is just scratching the surface of the awesome outfits that were there. Overall, I had a lot of fun. It was an exhausting weekend but I enjoyed it immensely. Where do I sign up for next year? 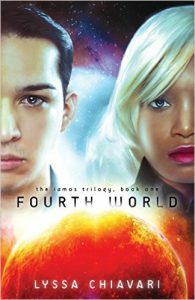 I’m continuing my series of giveaways on Tumblr with Fourth World by Lyssa Chiavari. I chose this book because as well as having a racially diverse mix of characters, it has a protagonist who is demi-sexual – and who actually uses this term to describe himself. This shouldn’t be a big deal, but it is. The other protagonist appears to be asexual but this isn’t explicitly stated in the text (mostly because she would have no context for the term). If you want a chance to win this book, go over to Tumblr and reblog the giveaway post. 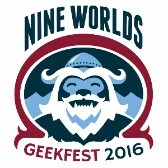 This weekend, I will be at Nine Worlds, which means I won’t post my usual Saturday blog post (hence this early post). It should be a fun event with talks, panels, cosplay, and catching up with fellow geeks. The editor who’s working with my on my Codename Omega books will be there, so it will be great to catch up with her (she’s just sent me the edits for the third book in the series). There is an indie author book stall in the expo hall. Myself and several other authors will be selling our books on this stall. If you want to come and meet me, get a book signed or just chat about books, I will be manning this stall on Friday afternoon in the expo hall. Let me know in the comments if you’re going to be there and want to meet. I’m sure I will have some great photos and stories to post after the event. I will keep you posted. Hi! My name’s Helen and I have an afro. I’m not sure whether I’m growing it or it’s growing me… I live in London and spend most of my time trying to figure out how I could have a dog. Now please share a little bit about your books. So many favourites! I adore my main character Eve, I’ve put a lot of my little sister into her. I’m loving writing Hannah, the first main character of the second book, she’s turning into a master manipulator. Actually- my favourite favourite is Grace Gupta, who is just angry all the time. She’s great. If I’ve had a hard day there nothing like writing a bit of Grace as a way to vent. How about a favourite moment? Hard to answer without spoilers… It’s probably when Mare and Joel kiss for the first time just before the tidal wave… Although all of part two of my book is a contender for that honour- I actually got addicted to writing it! What made you decide to go down the e-book publishing route? I am not the most patient person (see Grace) and I quite quickly decided that I’d rather publish as an ebook, and start building up my fan base and my brand, than send letter after letter to literary agents. Once I’m making enough noise they might come to me- if not, never mind, my book is out there for the world to enjoy. 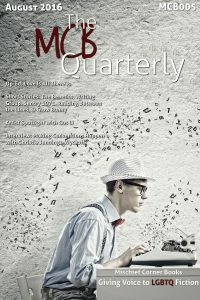 Is there anything that’s surprised you since getting published? Maybe how difficult it is to get yourself out there. I do events, social media, blogging… marketing a book is harder than writing a book. Are there any authors who particularly inspire you? Malorie Blackman, who wrote my favourite book growing up ‘Thief’. She also campaigns for greater diversity in books which is so important. I am of mixed race heritage and Eve, my main character, is too. My character Hannah is gay, Grace has Indian heritage, Peter is Scottish… I feel like Malorie would approve. Would you believe that I do my best work on the London Underground? There was one job where I had a particularly long commute and I wrote most of my first book travelling to and from work. I have a twitter site called #creativecommute, so if you do writing on your journeys tag us and we’ll share. What advice would you give to someone who’s just getting started writing books? Set yourself an unrealistic deadline and then try and meet it. I decided I wanted to write a book before I turned 29. This was 3 months before my birthday, but I actually did it- my first draft was ready for April (17th if you want to send a card) and I released the novel digitally on my 30th. There’s a lot to be said for challenging deadlines. 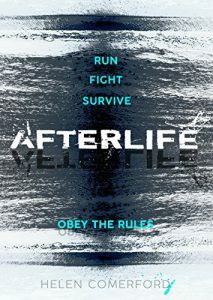 If you want to find out more about Helen’s books, check out Afterlife on Amazon or go to her website at http://afterlifethenovel.com.